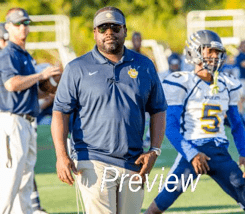 After a 5-0 start and a huge win over Roswell, Coach Collins had led Wheeler to a top 10 ranking for the first time in 25 years (in the state’s largest classification). Coach Collins has been with Wheeler since 2009 after stints with Pebblebrook and Chamblee. He has led Wheeler back to prominence only seen since the days of legendary head coach Corky Kell. He took over a team that had been on a 21-game losing streak and has totally revitalized the program to get them to where they are today.